Honey Bee Weddings: Say Cheese! Photobooths have been a long time passion of mine. As a kid, I used to take photos at the mall all of the time with my friends. It was one of my favorite things to do! Here are some terribly embarrassing pictures with my MOH, Nichole. I wanted a photobooth since I started wedding planning. It was on my Maybe List until I worked at the wedding of W + E. The couple had a photobooth and it was a huge hit! The photobooth moved to my Must Have List but not my fiance's. 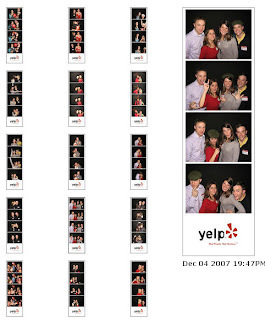 We went to the Yelp! Elite Holiday party. At first, no one realized that there was a free photobooth. Then, there was a line just to get some pictures taken. It was very popular for the entire night. After taking a few pictures with our friends, my fiance totally agreed that we had to get one. Here's a screen shot from the online photo gallery. The photobooth looks a little nicer than the ones back in the day at the mall. We're getting the Basic Package from Photobooth Express. We're getting the deluxe photo booth, a technician tooperate the booth, unlimited photos for 4 hours and a password protectedweb gallery of all of the photos from the event. i love photobooths! your guests will loosen up and have lots of fun with it! http://www.rentphotobooths.com has DIY options starting at $495 for 100 sessions, about 2 hours of service. With an attendent their prices are a bit more, but still not bad. They offer double strips so you can keep a strip and your guests can keep a strip and this month only they are offering a free scrapbook with any package, free event logo and text and free high resolution CD if booked before March. They have a pretty cool web site where you can check your date's availability and even book online.